Cathaoirleach of Donegal County Council, Cllr. 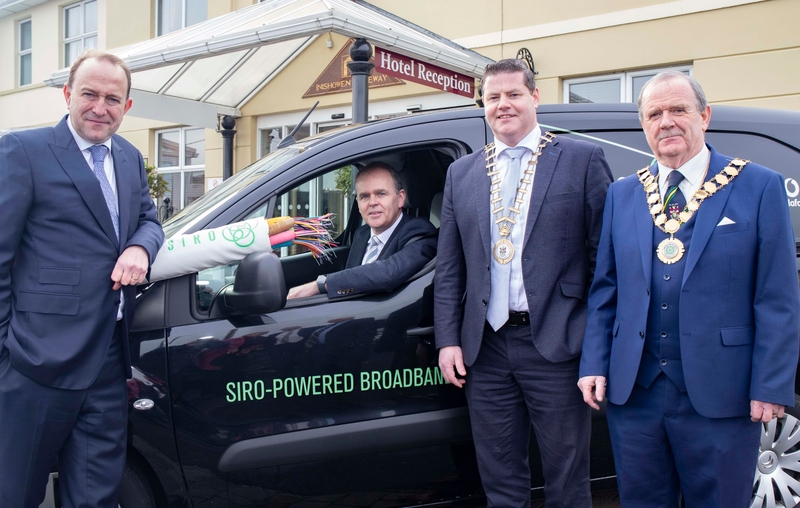 Seamus O’Domhnaill has today welcomed the launch of the SIRO Fibre to the premises broadband roll-out for Donegal Town, Ballyshannon, Bundoran, Ballybofey/Stranorlar and Buncrana, describing it as ‘a very good news story for County Donegal’. He said: “The announcement, which will see a further 14,000 premises passed throughout County Donegal in addition to the 11,000 premises already passed by SIRO in Letterkenny, marks an important milestone in Donegal County Council’s journey over the last 20 years." Following the closure of the Fruit of the Loom and the loss of thousands of jobs in the Donegal textile industry in the late 90s, an Employment Task Force Report established amongst other things, the poor state of telecommunications services in County Donegal. Donegal County Council has worked with Government, Telecommunications Service Providers, the EU and others to encourage investment in the provision of high speed resilient backhaul and end user telecommunications services. In addition, the Council applied substantial own resource funding to a range of telecommunications initiatives including the Metropolitan Area Network development, and community based wireless broadband services serving rural areas. Cllr. O’Domhnaill said: “Those years of effort are now paying significant dividends. Letterkenny has developed a very substantial digital cluster supported strongly by high speed telecommunications services, including direct connectivity to North America. Now the sixth largest FINTECH cluster in Ireland, our objective is to grow the Letterkenny cluster even further but also to extend it out to other parts of the County. Cllr. Martin Farren Chair of Inishowen MD also welcomed this announcement and was particularly pleased that the announcement was made in Buncrana in Inishowen: “This is a very important announcement not just for Buncrana but for the entire county. The importance of high speed broadband cannot be overstated in todays world and the Digital agenda is especially important for Donegal in terms of job creation and business development and I wish SIRO every success in the roll out of this infrastructure”. In addition to prioritising high speed broadband roll-out, Donegal County Council is leading out on the implementation of a Digital Strategy for County Donegal. Another Donegal Digital initiative is the provision of public Wifi and work is underway on planning the deployment of free public WiFi services throughout Donegal following the recent announcement under the Wifi4EU Scheme at the end of last year. The Donegal Digital programme has been recognised by the Department of Rural and Community Development with the approval of two funding proposals under the Digital Innovation Programme. The first project is designed to address a mobile phone blackspot at Malinbeg in south west Donegal, whilst the most recently funded project seeks to establish a trial “Internet Of Things” network which will allow the council to monitor river levels, air quality, road temperatures and so forth, using specialist sensors. Cllr O’Domhnaill added: “None of these initiatives can happen without high speed broadband, and in that context, I want to thank the team at SIRO for their investment in and commitment to Donegal and we will continue to work with them to hopefully carve out other potential projects downstream as we strive to implement our Donegal Digital vision for the future”.